On the 5th day of running, racing gave to me: 5 reasons to love 5Ks. (Almost) everyone loves to run a 5K race – except me. Throughout high school cross country and track, we always had short, fast, intense races 3 miles or shorter. I thought I was going to die trying to sprint for 8 laps around a track. I gave all my heart and oxygen when competing, but I hated it. I wasn’t meant to be a speed demon – I was the tortoise who was totally down with being slow and steady. 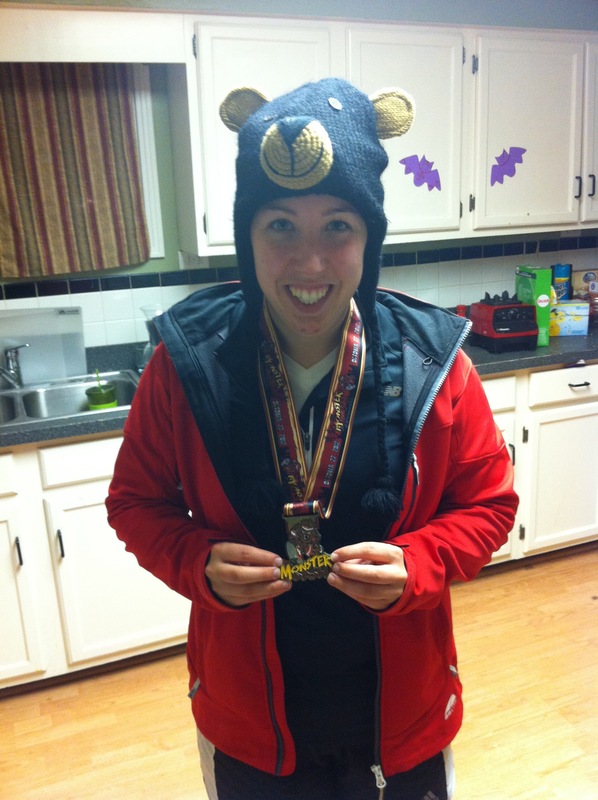 So when I discovered half marathons, I was in love. Everyone it seemed could run a 5K (3.1 miles) – they were short and easy. Only the tough braved the adding an extra one to the mileage – 13.1 miles. Also, being a runner with good control at a moderate pace and lots of leg strength was incredibly beneficial to racing half marathons. While everyone’s dying mile 9, I come from the back of the pack and make my way up. It was awesome. But then Jason came along and again broadened my running horizons. He insisted we run the Fibro Fun Run-Walk 5K in September, held at the Athletic Club of Overland Park, that was put together by one of the trainers at our gym. I agreed, mostly because it supported our friend Emily but also because the money went to a good cause, and what’s one more running shirt? The first time we did this race in 2011, I didn’t have any goals for it until these very young 11-year-old-looking girls showed up with their coach. I could NOT let an 11-year-old beat me. Granted, they were probably 7th or 8th graders taught to run at an early age, and I’m all for recruiting runners, but all of us have had our runner pride rear its sweaty head. So motivated to beat the 11-year-olds, I pushed my running the best I could, using racing tactics I hadn’t really thought about since high school. Jason and I were dying but determination won out, and we finished. In fact, I got a second place medal for women…with a time of 27:23, 9-minute miles. 9-minute miles aren’t bad, but they certainly aren’t competitive in the running world. Also, for all my hard work in high school, I had just run a race slower than my cross country pace and had finally earned a medal. It was ironic. 1. Great speed work – Think of the 5K as a way to test the speed work you’ve done and a way to add to it. Although you are going to be out of breath and swear you are going to die, it’s for a very short distance, and having other runners nearby gives you motivation to keep going. Pick someone in the pack you and make it a goal to stay with him/her or try to pass this person. 2. It’s over before you know it – I love my half marathons, but they take hours – both to run and in prep time. You must wake up a few hours before your event, eat a lot of calories, worry about gels/energy drinks, figure out if your outfit will be comfortable for two straight hours of running, take two hours to run, take maybe a half hour to hour after the race to re-fuel and try to remember what year it is, and you will almost certainly spend a good chunk of your day napping. Your entire process for running a 5K can be over in 2 hours. Small breakfast with no worries about calories or extra fuel, almost anything you wear will be bearable for 30 minutes, and it takes around half an hour to run it. You enjoy a great run and still have time to save the world the rest of the day. It’s a really nice break to have a race that you don’t have as many worries for and that you don’t have to be as serious about. 3. 5K runs usually have a fun theme – the Westport St. Patrick’s Day Run, the Monster Dash 5K at the Rivermarket in October, and the Santa Fun Run 5K at JCCC in December all encourage dressing up. 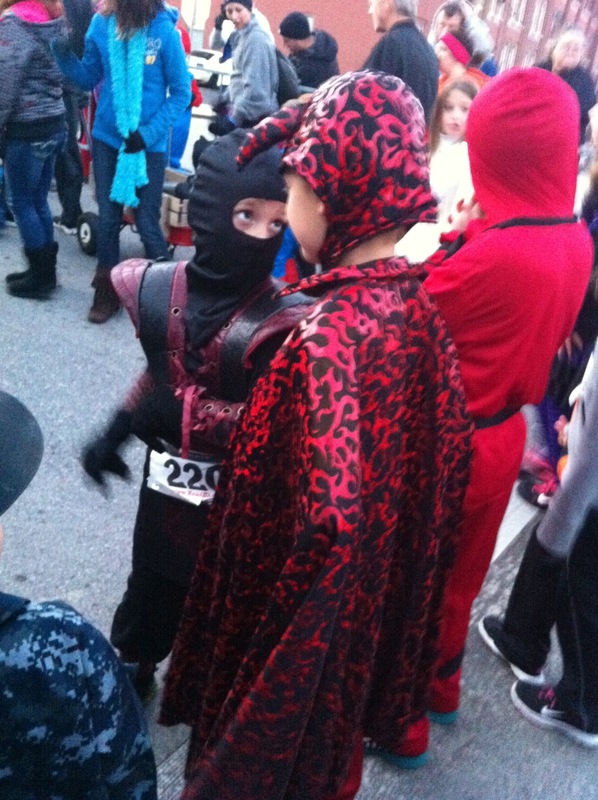 Those races have Kid’s Runs and Costume Contests, in addition to the usual top 3 age group awards. It’s is adorable to watch the little kids try to race, and it’s always a treat while you’re running to see all the fun costumes. 4. 5K runs are a way to give back to the community – Most 5Ks donate a certain amount of the registration fee to charities and good causes. In a way, running a 5K is volunteering your time and donating money while getting to do something you love. You can also be a volunteer and help . It’s win-win for everyone. Maybe you don’t have time to regularly volunteer somewhere, or you don’t have a church to give an offering to, so this is a great alternative way to help the community. 5. You can be competitive or have fun – Some of the races we’ve done have been very small, like the Buffalo Century Run in Leavenworth, KS, and some have been huge, like the 5K/8K CliffHanger Run in North KC on the river. Sometimes running your fastest means you can pull off an age group award, depending on the size of the race and the ages of your competition (Jason frequently beats me but because his age group is so crowded, 30-35, he usually missed out by a spot or two for top 3). Sometimes it’s better to just enjoy the run and scenery and know you win because there are pancakes at the end (CliffHanger and Santa Fun Run). Jason and I have a friendly competition going. Because we both ran so fast trying to beat each other in the Monster Dash 5K, we ended up getting our PRs for the season. It was awesome. I also got second in my age group and got their cool Monster Medal. This one I definitely fought for and felt it was well-deserved.